It's a grand old building, just a few doors away from my front door. 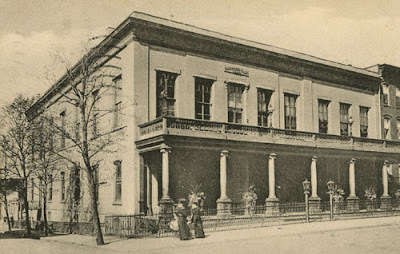 Once known as the Deutscher Club von Hoboken, it became the Union Club as World War II loomed, and became condominiums as such clubs in Hoboken began to give up the ghost soon after the turn of the 21st Century. I like the old postcard picture my friend Slezak sent me. Last week as I came home I noted men at work trimming the old building out with a bit of copper. Looks pretty smart, and of course, will take on that patina of verdigris as it oxidizes over time. As you can see, the old lady has grown in height since the year the first picture was taken. Wonder what those upper-floor condos look like. Looking with a realtor at one of my favorite buildings (pictured in the previous post), I was shown the dumbwaiter in what is now the master bedroom. "I don't know if you know about the dumbwaiters in Hoboken," the realtor said. "But this was one of them. They are now great for storage, and sometimes provide a little closet." As a matter of fact, I had been told about the ubiquitous dumbwaiters by my blog correspondent Jim B, whose parents were both teachers in the Hoboken school system of the 1950's. "I don't know if there are still dumbwaiters in Hoboken," Jim wrote, "but in the apartments we lived in, each night the buzzer would go off at 6 pm, and you would put your garbage in the dumbwaiter, and the janitor would take it to the curb. Garbage was picked up each day (except Sunday) early in the morning. There were usually lots of cans outside, and included were the cinders from any coal furnaces. "There were also street sweepers who had a garbage can on a cart, and a broom and a shovel. They would walk up and around the street picking up things. I think these were jobs for people who could not get other jobs. There were also attendants at the parks, they kept up basic cleaning there and did the occasional fixing up of things." I casually mentioned dumbwaiters to Slezak, who had this to offer: THE DUMBWAITERS ...in my building 924 garden,we had one...they were great fun to ride in as kids. We took turns riding in them. You pulled on a rope...one rope you go up, the other you go down. Not a safe thing to do. You had to look out for the rats too...that's where they lived. Climbing closeline poles was not safe either. We even had working gas lamps in the halls. NO bathroom, you shared a toilet with the people next door to you...in the hall. NO heat either...you had to make your own heat...Karo was used...it smelled and smoked up the rooms, BUT THAT WAS HOME...tappin' on the pipes was our intercoms back then, something like MORSE CODE. An interesting boyhood I had...but that's the way it was...not to mention the cockroaches...BUT THE RENT WAS CHEAP...all that fun for $35.00 a month...and you got 6 rooms...WOW. Like he says, wow. So many of the situations he mentions make me, a 21st Century, uptown chick from somewhere else, absolutely marvel at life as it was in Hoboken not all that long ago. When I list my needs for my new apartment, a dumbwaiter would be a plus for its historical and amusement value -- and maybe for storage. But I draw the line at a toilet in the hall, shared with the neighbors, even for $35 a month. Would you believe for my demands I'm going to have to spend at least $2,000 per month? I'm getting used to the idea, but I will insist that the rodent problem has been addressed. I noticed from the first that Hudson Street is a pretty impressive address. It's where Frank Sinatra moved his mother when he made it big and before she moved away from Hoboken altogether to Fort Lee. It's where the mayor of Hoboken lives. It is scenic and elegant, and my address, which is not exactly either, is at least convenient and on Hudson Street. The scene above is hardly a block from where my building is. It's on the left side, perhaps about where the Empire Theater once stood. The house I live in is in the middle of this picture, right behind the tree. Yes, there are trees in Hoboken, and they make it special. This is the building I have my eye on in case they have an apartment available when I start looking in earnest in October. It's a building that's been there since the 1880's, once having the really big apartments of that era. Since that time, they have been divided into smaller, more compact units. I keep thinking if I lived in that building I would always be aware that I was living is a section of what used to be a real apartment. 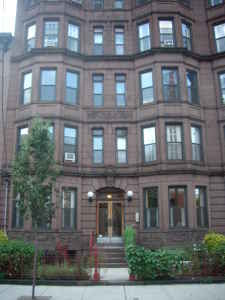 But the front apartments with the bay windows, retain an old-time elegance (like me). I hope I get one. It's a pleasure to stroll up and down Hudson, noting the many lions at the front of the houses, catching a glimpse of an antique crystal chandelier in the front hall from time to time, and getting a feel for Hoboken's heritage. If you're lucky you might snag a third-floor walkup with a lousy bathroom and no intercom to connect you to the front door and be able to tell people you live on Hudson Street. That happened to me last October. It was a beautiful day, if you can stand temps in the 90's. Humidity levels of 29 to 39 are still unbelievable to this body of mine, so acclimated to the swampy heat of the deep Alabama South. I started my pilgrimage early (too early;I left the apartment at noon looking for an event that didn't start until 7 P.M.), and ended up at my destination twice. The first time it was just being set up. The morning trip just about did me in, even without humidity. It was so hot I thought I'd die, dragging along the sidewalks looking for a spot of shade to cross into as I made my way across town toward the beautiful St. Ann's church which was to be having its annual party. I made the mistake of calling it a "festival" and was quickly corrected by a native (or B & R as they call themselves here). It's a feast, said she, don't call it a festival. Gotcha. The biggest gotcha was that I misunderstood the time and had to make a second trip as evening came. The warm night breezes wafted the fragrance of food my way as I walked toward the feast. Sausages, pasta in tomato sauce, and zeppoli being deep fried wove together in a blanket for the nose. The sounds of a crowd, and a voice on the steps of the church was miked out for the crowds sitting there with plates of food, sitting in couples, visiting, and half-listening to the message of doing God's work in today's world. Somebody was selling spinakopita and I almost talked myself into buying one with the rationalization that "at least it has spinach in it; it's good for you." I decided instead to wait in the line ("on line," they say here) for a small paper bag of zeppoli -- three for $2, can't beat that price -- just to get in the spirit of the event. I came home convinced I had walked off the calories by having walked there and back twice in the same day that I ate the zeppolis. And felt comparatively virtuous because I saved one for my coffee this morning. St. Ann's Day is next weekend, where they'll have a Mass, a procession, and more food. Roy Haack and I were chums when we were kids. We had our big fight and fast became friends. His mother, Loretta was a Councilperson on the City Council and held that position for two elections, I seem to remember. Loretta had a wooden leg, I don't know how she lost her leg and never bothered to ask. You didn't ask questions about people. It just was not done. Roy's dad smoked great-smelling cigars and his grandmother made the best dumplings that I have ever had in my life. Yes, I am leading up to a story, just giving you some background for it. trying is more like it, down in the cellar in Roy's parents' woodshed, more like a storage shed. Both of us were choking on the darn cigar, but we told each other it tasted good! Gotta keep up the big shot thing, you know. As we were smoking it Loretta's extra wooden leg fell off of the shelf in the shed. All we saw was the foot and the both of us ran out of that shed like the devil was after us and yes, we held onto the cigar. Scared is not the word both of us felt that day. We buried the cigar in the back yard, just as you would bury a pet. No more cigar smoking after that experience. I know it's a stretch, but I also was pretty sure that title would get your attention. Here's the point: Now that I'm in a position to think about looking for a better apartment -- my house in Fairhope has been sold, and my financial position is considerably improved. I watch (compulsively, perhaps) the Home and Garden cable TV network, seeing such shows as "Get It Sold," "House Hunters," "Designed To Sell," and so on. I even like "Sell This House," "Moving Up," "Property Ladder," and "Flipping Out," on other channels. So here's this glamorous model, upgrading her necessities in the City of Light. She says to the realtor, "I'd love to find a place where I wouldn't have to walk up three or four flights of stairs. But then, this is Paris, and that's the price one expects to pay to live in a beautiful old flat in Paris." I look out the window at Hudson Street -- beautiful old 19th Century mansions, now being rented out floor by floor as apartments -- and can say the same thing. "Well, this is Hoboken, and to live in a beautiful old place, you're probably going to have to live in an apartment three or four flights up." In some ways, it's like Paris. Mostly everyone had a nickname. Either they get one early in life or later on in life. Some got one for what they did when they got locked up, others for what they did for a living, honest and dishonest, but then who am I to judge them. Some ran numbers, some took bets on horses, some did other things. All were accepted as friends, no snobs in Hobokenites. There was, and this was in High School, Joe Nose, Bobby Tag, Jew Boy, Mousey, Wacker, and various other names. Later on it was, as a adult, Willie over the barrel, Jackie the Sport, Broadway Tony, John the shark, Vinnie the Bandit, who was a sweet man, no, he was not gay. Even in Abel's Ice Cream Parlor as a teenager there was Eddie the Criminal. Never found out what he did time for, but he could not have done anything like a bank hold up, that was for sure. Down the docks everyone had a nickname, like Bobby Bananas, the Cowboy, who was found with his head blown off in his own car. We were raised to accept these names and never laughed at them. Most of these people grew up and are still known, and died with these names. Sometimes nobody knew their real name! AND you never asked for it neither!!! When George Crimmins first became Police Chief, he was dubbed the "Sewer Rat!" This was because he would check up on the cops who worked mid-nights and if he caught them sleeping on duty, sent them home, with no pay. George was a real nice guy to people. He listened a lot. Ever notice how Hobokenites all talk with their hands? They know all the right gestures to make, when they get ticked off in a few languages! Yeah, when I get angry, I have to watch myself not to do these gestures. Old habits are hard to get rid of. It is funny, nobody ever got ticked off by being called a nickname. It just was accepted as a part of life and sometimes it was a hard life. your health?" The second, and the important one is, "Whatta you do for a living?" Reader Jim B sent me a couple of pictures of the old shipyard, this one taken during a snowstorm, both taken in the not-so-distant past. This one shows the old NY skyline, before there was a convention center. Emphasizing his Hoboken background, Jim writes: "My parents were both teachers in Hoboken, Dad was at Demarest and then Hoboken High when it opened. He was also the first football coach at the high school. He also ran the visual aid department and made the morning announcements on the school loud speaker. Mom taught at #3 school. Both retired in the 1970's. My younger brother and I grew up in Hoboken. My aunts and uncles lived in town, and most were also teachers. My brother and I went to Brandt School, most of our friends went to Wallace. "The can company had a plant next to Maxwell House Coffee. One of the jobs there was interesting, if the coffee line broke down, he would sweep the cans to the floor. If the can line went down he would put the cans back on the line. "You had a piece on the clothes poles, We all had them out the back in an alley where we also played ball. Each pole had about 20 clothes lines coming from several directions on it so climbing up on it was a hazard. You used the spikes that were on the pole to climb up. "We played most kinds of ball in the alley between Washington and Hudson Street. On what is called the yellow flats, all the basements were connected and we played in them. Lots of the people we played with became teachers in Hoboken. 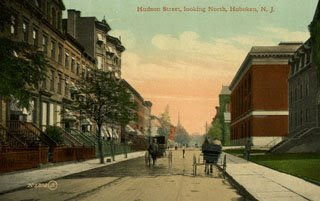 On Hudson street we had a basketball net on the Gate at 12th street, and played stickball and football at Bethlehem Stadium (the yard side of Hudson Street). "Some of the places we like to go to included Helmer's on Friday (lots of teachers), the Town Lunch on Washington Street, Umland's, and Snackies, Gold's, and Jacodine's opposite Demarest. We would get pizza and mussels at the Blue Point. O'Grady's deli on 11th street was the deli of choice. There was a very small A&P on Tenth and Washington, and a good butcher shop next door, which I think was Mickey's. You could earn money carrying bags home from the A&P, and most stores had delivery boys. . We got vegetables at Tony's, 5 cent soda and high bouncers at Rays, both of which were on 12th and Washington. There were still occasional horse drawn wagons with fruit, ice and sharpening for knives. When people talk about the big parades they were right. Memorial day would have a parade up Washington, and then to Elysian Park. In 1955 there was a hug bicentennial day where Washington was closed off and it was all shops and all kinds of food. 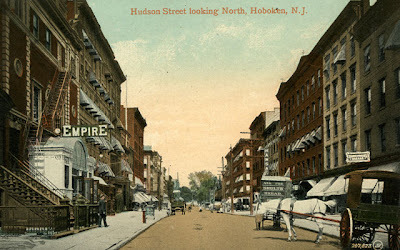 "I attached a picture from Hudson street taken from the roof of our building, it shows the Lipton tea building, and the tracks on Hudson street. Those tracks are gone now. A police car is turning onto Hudson from 14th, and going past a truck parked by a fire hydrant. Looks like the truck is selling vegetables or fruits. The little cove is the place where the fishing boats would tie up for day fishing. "Hope you enjoy Hoboken, it was always a place where you could feel good. People knew everyone else, which could be bad if you did something wrong. If you have any questions on my ramblings let me know. I have other pictures of uptown, mostly views of the shipyard and Maxwell House, but I failed in technology courses and have to figure out how to send them." Great stuff! I'm sure lots of my readers will want to add their memories to these. When Demarest Middle was a high school, it had an unforgettable principal, Artie Stover, a nice man the students secretly admired but in the way of high school kids everywhere, tried to find something about to ridicule. Turns out the funniest thing about him was his shoes. Some say he had squeaky shoes you could hear coming down the halls. Other say he wore those silent sneakers before everyone in the world wore them. My pen pals from the 1950's have different things to say about him, but they can't forget Mr. Stover. "The Rabbi" Maloney writes: "Lately I have seen people refer to Mr Stover as 'Artie.' To this day he will always be Mr. Stover to me. We never referred to him as Artie. Now think for a moment. "Would anyone have the patience that he had? Look at all he put up with trying to keep teenagers on the path of the straight and narrow. OK! "We joked about his shiny gray suit and those squeaky shoes that he wore. During a fire drill you could hear him upstairs walking, squeak, squeak, squeak, down the hallways. I seriously doubt if anyone ever heard him holler at any one person and chew them out. "His gray hair was always combed nice, and he conducted himself properly as a principal all those years. On a Saturday you would see him in a pair of overhauls doing plumbing work in a building that he owned and it would seem that he was above doing that kind of work. Here I am, doing the same thing, meaning plumbing work on my own house. He would change locks. You might say he was a handyman during the weekends. "Mr. Artie Stover as you know was principal of DEMAREST HIGH SCHOOL...a fair and honest man, a man who should be remembered for his knowhow and love for the students, and his winning football team...and the lovely CHEER LEADERS and MAJORETTES that always was the highlight of the many parades we had in Hoboken. they dont have parades anymore DO THEY? How sad. MR .STOVER was the owner of many brownstone houses in Hoboken and he did all the repairs himself. He offered me a brownstone building on 7th and Garden for $12,000. I thought that was too much....HOW WRONG I WAS. The editor of Newsweek Magazine bought it. It’s worth today $$$$$? No regrets...things happen for a reason...if I stayed in Hoboken i would not have what I have now...a large and lovely family...AND A PARKING SPOT FOR MY CAR. "Mr. Stover always wore them goofy rubber soled shoes...and you never knew if he was coming, if you were doing something wrong. I’m sure he’s gone by now, but he will always be remembered.. DENNIS (the rabbi ) MALONEY pulled a few stunts back then, putting pigeons in the piano during a Stover speech to the students...and tying condoms to all the door handles of the school one morning, causing a delayed opening. Mr. Stover had to remove them, very carefully. Dennis the Menace never got caught, but we all knew he did it." I'll leave it to Dennis, or his friend "Anonymous," to confirm or deny Slezak's allegations here. Fun to read about and remember -- whoever did it. If anyone knows better, let him or her step up now and tell us the story. Pidgeons in the piano? That must have been a difficult job. 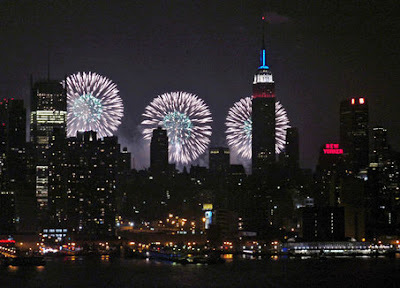 There it is, courtesy of the wonderful blog Hoboken Now: Independence Day in Hoboken. I've experienced the 4th in many places, in many ways. Growing up in Fairhope, Alabama, I saw the fireworks displays every year on the bluff on the eastern shore of Mobile Bay every year until my early 20's. I was in New York City with the Tall Ships display in 1976; with my sister and friends we viewed it from a rooftop at Westbeth. I lived in Geneva, which has as big a celebration of the 4th of July as anywhere in Europe (and maybe the world), and for six years I watched hang gliders jump off the Salève, ate hot dogs made of Swiss sausage stuffed into rolls pierced on the spot with a special appliance just for the purpose, and met vacationing backpackers from the States who had come to the event because they read about it in Let's Go Europe. All kinds of unorthodox things happened at that fireworks display, and I heard some stories that may have been urban legends I will not go into here. Whenever the day rolls around, I think of my country and what has become of it. I love to acknowledge what it was, and what it was meant to be, and I am proud to have that as a part of my own history. I even think of old Fairhope, really a young town, built as our country was, on a utopian ideal. Never mind that both are pretty much a shambles now, overrun by the same marauders of the soul: Personal greed and a deep immorality of the spirit. There is a glimmer of hope in the land this year, and I cannot dwell on the negative today, because the day itself is a celebration of what we should be. Yet we all know that in order to make things better we must be able to see what we know they can be and remember what they have been. So I think I'll go back to John Adams, who in the early days of our country predicted the future 4ths of July in a rather nice letter to his wife: "I believe that it will be celebrated by succeeding generations as the great anniversary festival," he wrote, "It ought to be celebrated by pomp and parade, with shows, games, sports, guns, bells, bonfires, and illuminations from one end of this continent to the other..."
It is that and more, Mr. Adams. And in Hoboken, I'll be able to see fireworks to the east in Manhattan and to the west (out my kitchen window)on the bluff of Jersey City tonight.